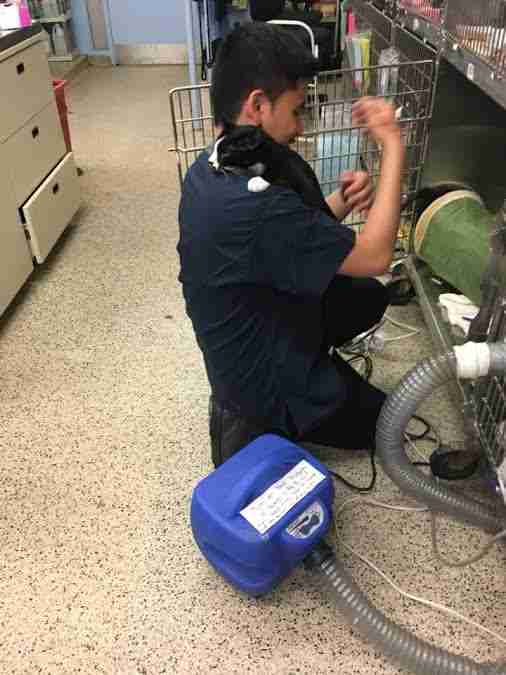 Lots of cats love to cuddle, but a 3-year-old cat named Zorro takes cuddling to the next level. 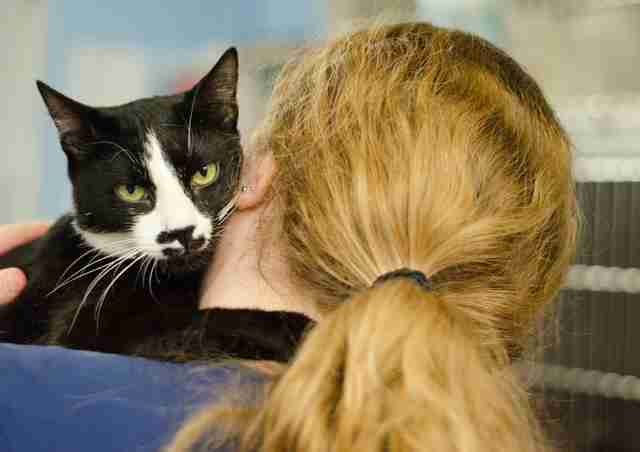 Whenever people pick him up, he latches onto them and nuzzles into their necks for a great, big hug. 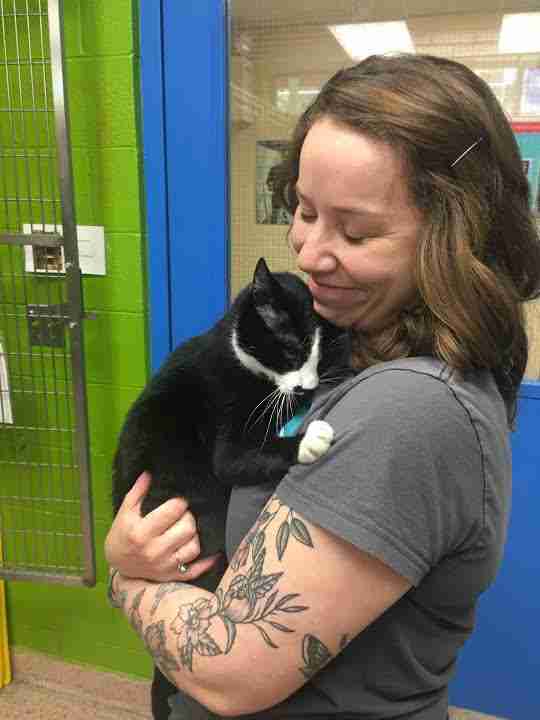 This extra-cuddly cat first arrived at a shelter run by the Pennsylvania SPCA back in January. 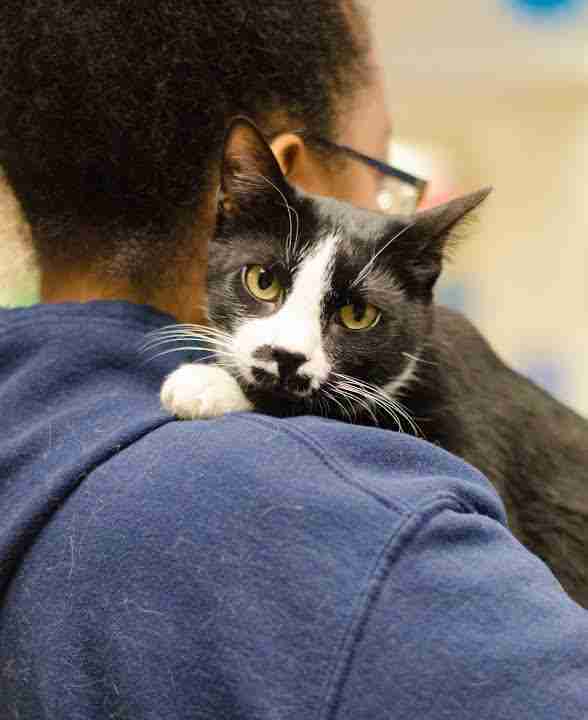 At first, the shelter staff didn’t have any idea that Zorro liked giving hugs, or even that he was affectionate. In fact, they wrote on his files that he “didn’t tolerate a lot of handling,” according to Kocher. Shortly after Zorro arrived at the shelter, he got sick — he was urinating more than usual and sometimes there was blood in his litterbox. When he was sent to the shelter hospital for surgery, the vets diagnosed him with having bladder stones. Thankfully, the vet team was able to perform surgery and help Zorro get better, although he'll need to stay on a special diet, Nau explained. After the surgery, Zorro stayed in the recovery area for a couple of weeks, and this is when the team started to figure out how special Zorro was. 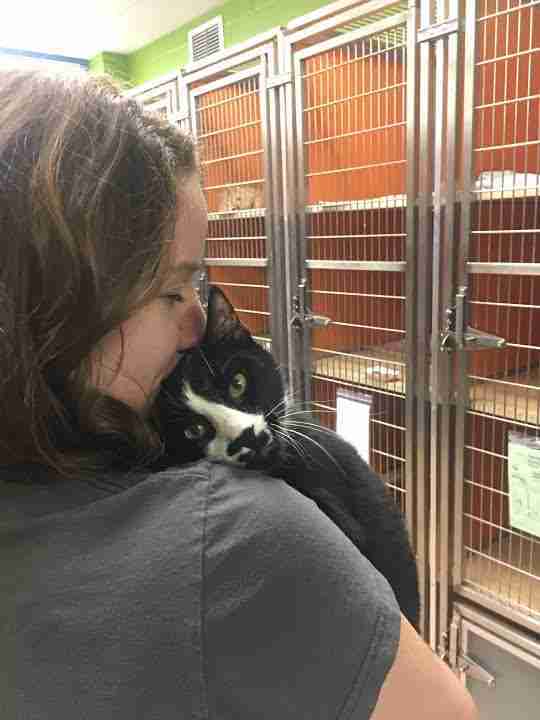 Despite Zorro’s lovable nature, he’s having a very difficult time finding a home, and no one at the Pennsylvania SPCA can understand why. Zorro will need someone who is OK with feeding him his prescription diet, Kocher explained. He’d also be great with small children, and fine with living with other animals. But most of all, he just needs a family who will give him hugs — lots and lots of them. “He’s just happy being hugged,” Kocher said. If you’re interested in adopting Zorro, you can contact the Pennsylvania SPCA. Thinking about adopting another animal? Then meet Dodo Adoptbot, an interactive guide for new pet parents. Get started on Facebook Messenger or text HOME to 38349.